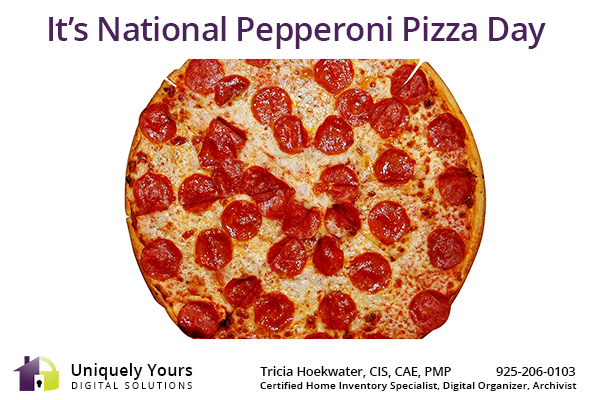 NATIONAL PEPPERONI PIZZA DAY: It’s a day to celebrate America’s favorite variety of pizza. Almost everybody loves pizza. Pepperoni is the most popular, preferred by 36% of people. Go Paperless with Your Digital Legacy! A Digital Legacy is your virtual, secure, safe deposit box. It contains your key information, wishes and life documents in a centralized online portal. This is your tool for managing all your life documents, leaving your legacy organized for your heirs. Contact me via phone at 925-206-0103 or by email uniquelyyours@outlook.com to schedule your digital legacy appointment now.